“Picking a kicker is all luck" is something you hear less and less nowadays, and rightfully so; kicker scoring more or less follows a predictable pattern. It all comes down to using the Vegas lines, which have strong trends relative to kicker scoring that can be used to accurately project kickers and identify those with the highest cash game floors and tournament ceilings. The predictiveness of implied point total is uncanny. For example, kickers as a whole last season scored 10+ FanDuel points at a rate of 48.4% when their team’s implied total was 28+; when implied total was less than 28, their rate of scoring 10+ FanDuel points dropped to 25.9%. Game script plays an important role in determining how many field goal opportunities a kicker will receive. The average NFL team kicks a field goal on 75% of fourth downs inside the opponent’s 35-yard line when leading or tied, but on only 60% of fourth downs when trailing. 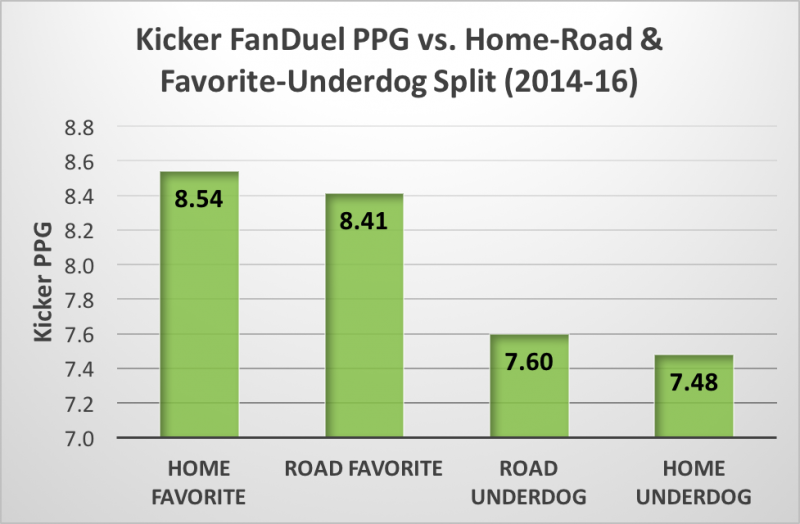 The Vegas odds capture this well: over the past three seasons, kickers on the favorite have collectively outscored kickers on the underdog by 12%. Over 75% of available kickers on FanDuel each week will tend to be priced in a $500 window between $4,500 and $4,900, so even though favorites' one-point advantage may seem small, it's critical differentiator in such tight salary quarters. On average, a minimum-priced kicker should be able to give you more value than a minimum-priced defense/special teams, but an expensive defense/special teams should be able to give you more value than a minimum-priced kicker. The $4,800–$5,300 range has been the sweet spot for peak kicker consistency. Defense/special teams also peak in that range, however, so both positions would by default take equal priority in terms of salary cap allocation. That said, there's usually a greater amount of available options at D/ST options at lower salary ranges than kicker because of the former's lower minimum salary. Why have kickers in the middle-to-upper salary tier been so consistent? 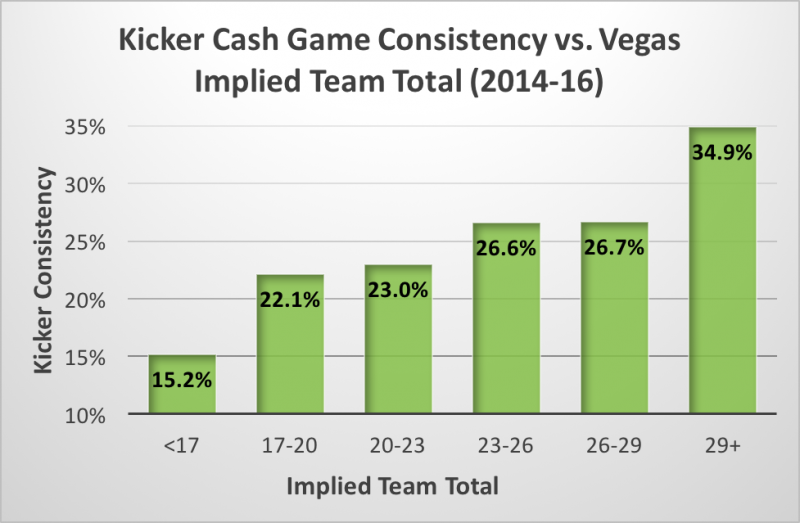 Kicker consistency tends to hold steady for Vegas implied point totals anywhere from 23 to 29 points, which comprise nearly half of all NFL games and a majority of kicker salaries. As long as underdogs and low implied totals are avoided, paying as little as you need to at kicker makes for a sound cash game strategy. There will usually be at least one kicker on the lower end of the salary spectrum that is kicking under ideal circumstances in a given week. 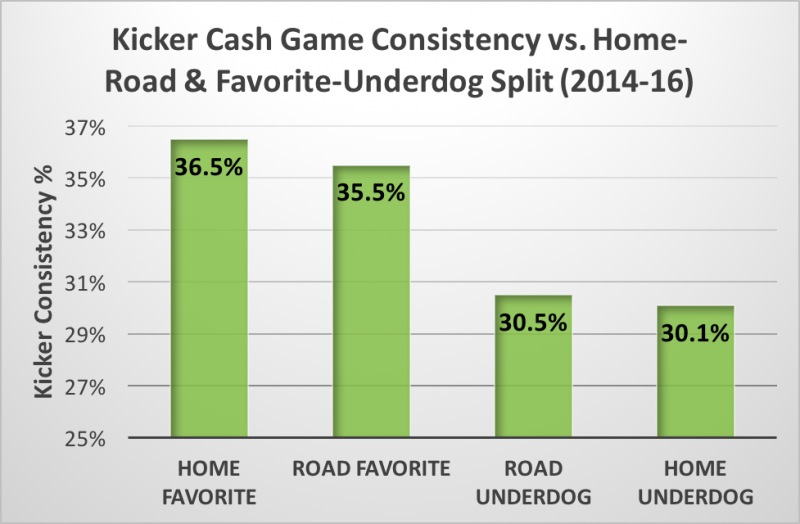 Kickers on favorites have collectively hit cash game value at a rate 6 percentage points greater than kickers on underdogs. 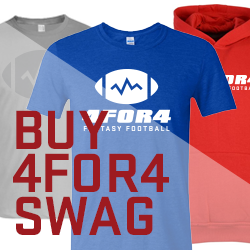 As with QB, RB, and D/ST, kicker is a position where you almost never want an underdog in your cash game lineup. Looking to optimize your cash game lineups by projected floor and expert picks/analysis? Subscribe to 4for4 now! Note: Data in this section was compiled from first-place lineups in the FanDuel Sunday Million tournament during 2015 and 2016. As with in many traditional fantasy leagues, kicker has been the black sheep of first-place lineups in the Sunday Million, posting a lineup-low 12.7 points per game average, which is nearly six points less than D/ST (18.4). First-place lineups have been winning with solid but unspectacular kicker production. Nearly 9-in-10 first-place lineups had a kicker score 8+ points and just over two-thirds of lineups had one score 10+ points, but only one-third of lineups had one score 15+ points. 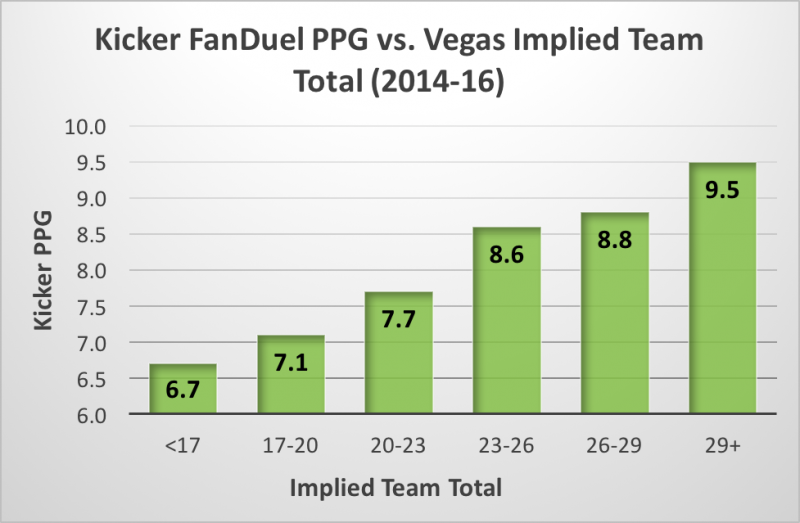 A closer look at the data indicates there are strategies relating to Vegas odds, salary range, ownership, and correlation that can help pinpoint a first-place-worthy kicking option. Kickers do not have as much top-end upside as other positions (including D/ST), though, so first-place lineups have been forgoing some upside at the position and choosing cost-effective options instead. Do these numbers mean you should always take a kicker priced $4,600 or $4,700? Of course not. But you should be willing to sacrifice some overall upside to save cap space in tournaments because kicker is a low-ceiling position. But it's not just shying away from the upper limits of salary that's a sound proposition; the $4,500 minimum should be mostly eschewed as well. Of the 181 instances of a minimum-priced kicker last season, 70% were either on an underdog, a team with an implied point total below 23, or both. Forty-four percent of kickers in the first-place Sunday Million lineups had ownership under 6% while only 13% had ownership of 15% or higher. The relative disadvantage of using kickers at either salary extreme explains their low ownership in the average first-place lineup: the field tends to disproportionately own the top high-priced and low-priced option at kicker each week, neglecting the valuable low-to-middle salary range. Using the Vegas odds to pinpoint kickers with decent upside in that range is a good way to differentiate your lineup. Another good way to differentiate your lineup is by taking advantage of the positive correlation between a kicker and his teammates. Just under half of all first-place lineups paired a kicker with another member of the same team and every position was represented. Sometimes a kicker will get unlucky when his team scores only TDs, but in general, the offenses that score the most points in a given week will tend to score the most TDs and field goals. While kickers are positively correlated with all of their offensive teammates, their correlation to defense/special teams is even stronger. In fact, the only positional pairing with a stronger correlation on FanDuel than K-D/ST (.29) is QB-WR1 (.33). To see this strategy in practice, look no further than Week 9 of 2015 when FanDuel user rtoraine got 30 points combined out of a Josh Brown-Giants stack with 5.4% combined ownership. Looking to optimize your tournament lineups by projected ceiling or expert picks/analysis? Subscribe to 4for4 now! Target the middle salary range for cost-effective consistency. Target favorites for maximum consistency. Balance upside with cost by shying away from either salary extreme.